Home » Adventure365 Sudbury Jersey JR.
Community is a huge part of who we are and why we do what we do at Adventure365. We strive to inspire and instill fellowship throughout the community regardless if you are new to a sport or an avid sports enthusiast. In 2017 we launched the Sudbury Cycling Jersey. 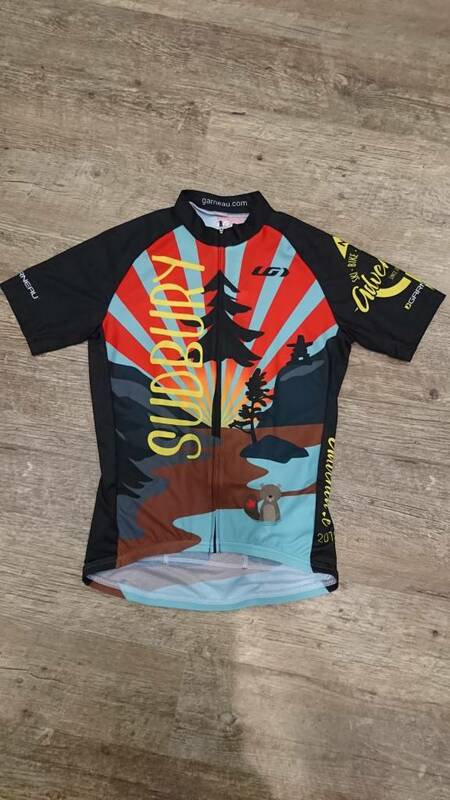 The Sudbury Jersey, designed by a local artist, allowed us to combine our love of cycling with our passion for giving back to the community. With 100% of the Proceeds from the Sale of the Jersey’s going back into the Community, we were able to donate a Bike Fixation Stand to both Kivi Park, and the Walden Mountain Bike Club, as well as support the Sudbury Cyclists Union and the Sudbury Para-Nordic Team. We have had the pleasure of seeing the Sudbury Jersey on group rides, at various events throughout Sudbury, and even travel to Europe!